Joining market leaders like Altendorf GmbH, Leitz GmbH & Co. KG, the SCM Group, Stiles Machinery Inc. and Michael Weinig AG/Holzher, the Biesse Group (Italy) has confirmed its participation in the Magna Expo Mueblera Industrial trade fair to run from January 17 to 20, 2018 in Mexico City. The company will showcase its latest solutions and applications on an area of over 200 square meters. In just a few months’ time, the gates will open on the international Magna Expo Mueblera at Centro Banamex in Mexico City. 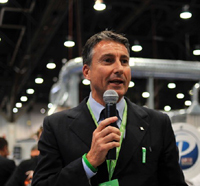 The event consists of two parallel exhibitions: Magna Expo Mueblera Industrial and Magna Expo Mobiliario e Interiores. Running from January 17 to 20, Magna Expo Mueblera Industrial will cover the world of machines, tools, equipment and solutions for woodworking and wood processing, while Magna Expo Mobiliario e Interiores will put the spotlight on furniture, interior decorating, household appliances and floor coverings. The double-header event will make digitization trends tangible and feature solutions and application scenarios as presented by local providers and major players, alike.